'Green Love,' epitomised a return journey for me, back to the singer-songwriter world that first pulled me into active music-making. So I Iet the guitars dominate, with only flashes and light touches of percussion or keyboards, just enough to round out the sound-world. I was looking to create a specific feel of robust but intimate peace, with a hint of the mood Japanese artists call 'aware', a sort of nostalgic, melancholic contemplation. 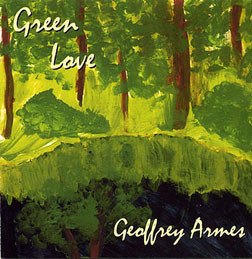 People who've bought "Green Love," often tell me they listen to it late at night, before sleeping, or as part of a calming moment after a day in the city. The tracks were ordered so that there's a journey, from lighter skippier moments to more stately, and I believe, deeper feeling moments. The idea was to create an 'album' rather than a random collection of songs, perhaps emulating the way David Sylvian's 'Secrets of the Beehive," or Gordon Lightfoot's "Sundown" unfold. Both records I used as aural references when mixing 'Green Love'. I truly enjoyed what was for me a musical renaissance as I created the CD, and hope and trust that something of that feeling will translate to you, the listener.